The minds of Dave McElfatrick, Rob DenBleyker, and Kris Wilson use imagination and humor to deliver a mastery of the unexpected. 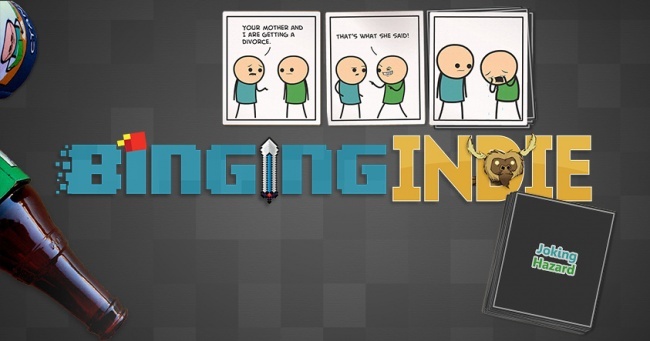 Their entertainment company, Explosm, has built their Cyanide and Happiness brand over the past decade, gaining a widespread internet following. The series started as a webcomic in 2005, and by 2010 they expanded into video shorts, eventually leading up their first crowdfunding campaign to fund an official show series. This February, the team announced a tabletop game, Joking Hazard, which hit its campaign goal in under 30 minutes. The heart of Joking Hazard's gameplay is Explosm's random comic generator. Three panels are haphazardly thrown together to produce a story. The Joking Hazard card game captures the essence of C&H in a comic showdown akin to Cards against Humanity. For anybody that doesn't know how Cards Against Humanity works, Explosm uploaded a video guide explaining the game, so people can see it in action. With the Kickstarter already wildly successful, we had the chance to talk to Dave McElfatrick and the Explosm crew about the project. He told me where the idea for Joking Hazard came from, "It sorta happened in natural steps. Rob one day decided to print them all out and screw around with them to see what happens, and eventually a card game was devised. It's fun for us as fans of the online Random Comic Generator ourselves," he stated. "It's a very conversational game, and trying to figure out the story within the comic you're creating as a group is hilarious." I wondered what the Explosm team saw as the key difference between the slower success of the original campaign and this new project, fully funded in 30 minutes and raising over $2 million with still a few days to go. Dave didn't hesitate, explaining, "With the show, people were taking a gamble... they didn't quite know what they'd be getting." As to why Joking Hazard was more of an immediate hit? Dave went on, "We've shown the finished product, we've demonstrated it and explained it clearly." He even had advice for Kickstarter newcomers: "Keep it simple." Dave reflects on what they learned after their C&H show campaign. He detailed the difficulties involved in physical backer rewards. "We offered all sorts of perks with the show Kickstarter ... and it took forever to get them out the door to backers," he explains. "This time, we're keeping it simple and making sure the game gets in everyone's hands as soon as possible." By scaling back on the rewards, the Explosm crew was able to focus squarely on the game. They presented to the community five different levels with ten challenges each, and rewards were additional cards, along with small booster pack bonuses exclusively for backers. Nearly every Kickstarter campaign offers stretch goals, but Explosm took it a different direction. Instead of strictly monetary goals, they made it into a kind of photo-op scavenger hunt. The community needed to complete seven of these in each level to advance. Mid-way through the level system, the stunts grew to impressive feats like crafting ice sculptures, to programming a C&H Flappy Bird remake. I asked Dave what inspired the stretch goal system: "Making the Kickstarter feel like a quest was something people could identify with. When I was young, and playing Mario 3, I'd get excited to see what the next world looked like, and that'd drive me on," he states. In under a month, the Joking Hazard facebook page attracted 20,000 likes and the twitter account acquired over 5000 followers. These social media pages are jam packed with kickstarter stretch goal participants sharing their attempts and stories about the adventures they went on just to help out. "People wanna rally as a team to beat these damn things because you want to see what crazy world full of achievements comes next. You want the satisfaction of knowing you beat something, and helped contribute in a fun way." Dave remarked on the public response to Joking Hazard: "Watching us beat our goal after 23 minutes was insane, and it keeps getting insaner. It's definitely been the most amazing Kickstarter we've done so far, and I thank the C&H so much for their support." The Explosm team forecasted which medium they planned to conquer next. "We're currently discussing the possibility of a video game. Yes, we want to develop video games - I think all of us have cool concepts for one. Who knows? You may see something crop up very soon ;)", they teased. The Kickstarter for Joking Hazard has 46,000 backers and raked in $2.2 million so far, but there are a few days left for those who prefer to be fashionably late.